[Translate] I’ve recently found out and shopped at OurHarvest. 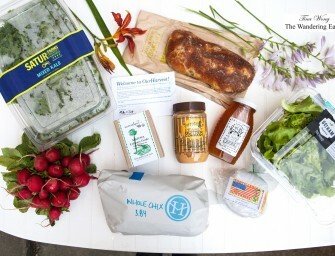 Our Harvest is an online farmers market that connects us consumers to local farmers and food producers (currently for the NYC area only). Through partnerships with farmers, fishermen, and food artisans, OurHarvest purchases and sources their products locally to maximize freshness; hence ensuring quality and traceability while keeping costs down and combating hunger at the same time. For every delivery above $25 it receives, OurHarvest also donates a meal to a family in need through its relationship with the Food Bank of New York City. My recent shopping haul consisted of..
[Translate] KitchenAid Convection Digital Countertop Oven & Diamond Blender; Pasta Excellence Set Our friends at KitchenAid sent me their amazing household products of the Diamond Blender, Countertop Digital Convection Oven, and Pasta Excellence Set (pasta stand mixer attachments since I own their Artisan Stand Mixer). Since spring is finally here and how can’t you not feel inspired to cook and bake anything? Strawberries are one of the ingredients that are prominent in spring and for breakfast, I like making smoothies besides my cup of coffee. It’s quick and easy for my busy mornings shuffling to work. I made batches of..